Do you draw? Paint? Sculpt? Make pottery, stained glass, take photos or wood carvings? 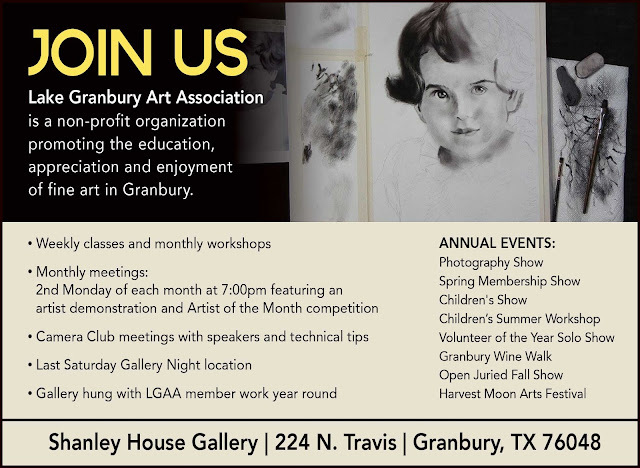 Lake Granbury Art Association members work in all these mediums and more. We invite you to become a part of our association. Our meetings are held on the second Monday of each month at 7pm. A photography only group also meets at on the 3rd Tuesday of each month. For more information call 817-579-7656. Receive discounts on workshops from nationally recognized artists hosted at the Shanley House Gallery. Workshops are available in a wide variety of mediums which vary each year. They may include: Oils, Pastels, Acrylics, Watercolor, Drawing, Stained Glass, Sculpture, Wood Carving and more. Participate in free weekly art sessions at Shanley. Mondays 9:30am to noon clothed models are available for life drawing sessions. Open Studio Fridays for LGAA members and their guests at Shanley House Gallery. Any medium. Just come on by with your current project and enjoy some camaraderie, inspiration and feedback from your fellow artists. 10am-1pm on any Friday. Check the Calendar under Events for details. Each summer the Art Association sponsors & teaches classes and workshops for children. To Join: You are welcome to attend a meeting or two to get a feel for the organization before joining. Annual Dues of $40 per person or $60 per couple. Now offering a lifetime membership for $250. YOUR MEMBERSHIP DUES ARE PAID FROM WHEN YOU JOIN UNTIL DECEMBER 31ST OF THAT YEAR.